I really enjoyed this beer! I was always interested in trying the white bottle with the pink elephant. Poured a pale bubbly yellow with a very fine white head. Smelled creamy and almost wine like. tasted sweet almost citrousy, like a mild orange flavor, a touch of sourness. Finished with a bit of licorice taste and a very crisp,clean smooth feel. This was a beer i'd enjoy sipping any day. Pretty much tastes like miller fortune. Not worth $15. Canned version with L6214 12:15 stamped on the bottom. Clear, golden body topped with a thick, sculpted head. Soft peach aroma blended with subtle hints of light, cereal malts; esters. Gentle sweetness to the flavor; banana and cloves; alcohol presence yet very tame; light biscuit taste; bitterness near the finish. Heavy but not overbearing mouthfeel; lush and velvety; slight tanginess. F: tangy bite and very little carbonation. Dry alcohol which drys the mouth out. Nice billowy head on a nicely carbonated body. Aroma is a nice mix of some yeastiness and some dough/breadiness. Taste is a sweet, yeasty and smooth finishing delight. Slight lingering bitter aftertaste that deters a little bit from the overall delighful experience. Feels about what a 8.5% Belgian beer should be at. A nicely made beer. Look: Pours orange / gold with a large, frothy head which dissipates fairly quickly. Slightly hazy. Smell: Floral and fruity. Citrus, banana, and apricot predominate. Taste: Immediately sweet like its smell, but gives way to a pleasant bitterness with smokey undertones. Feel: Light, highly carbonated - perhaps a little too much for my liking. High alcohol content is hidden fairly well, but the warmth comes through towards the end of a serving. Overall: One of, if not my favorite beer. Nothing I drink daily for the obvious reasons (cost, ABV), but something I'm fortunate enough to look forward to every weekend. I've been fortunate in that my local shops carry four packs of bottles and 16 oz cans as well as the 750ml bottle. Tried it on draft at Leesburg Public House (Leesburg VA). Loved it because I don't care for hoppy beers. Later bought it in bottles from Jungle Jims (Eastgate OH). Not as good in bottle, but a good beer. This was a present from my oldest son. He was trying to impress me by coming to Beer Advocate for a wonderfully high rating. How do I tell him it tasted like Bud Lite soaked in his high school gym socks? 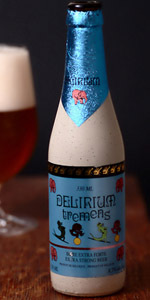 How can ANYone who's tasted really great Belgian ales give this more than a 2? The aftertaste is high rear on the roof of my mouth. My tongue rejected it Someone else on this forum suggested the taste of melted plastic in a cheap beer. I think my rating is better. The yeast that gave their lives to produce this should be embarrassed. It tastes like something I once had in high school when a wino bought us a 6-pack for $20. Bottom line: I will *never* have this again (unless one of my other kids gives me a bottle - in which case I'll man up and say Thank You while secretly cursing under my breath). P.S. I wonder if my urine will smell funny after drinking this? Absolutely garbage brew, don't know how they've convinced plebs that this is actually decent. Tastes like someone's old filthy underwear that's been baked under the Arizona sun for a week. Looks like Bud light and honestly I would prefer a macrobrew over this filth. Save your money for something better. Much better brews out there. Had this at the bar, it wasn't too cold and it shouldnt be. I went out and bought a bottle right away after trying it. Pours gold with a thick foamy head. Smooth and creamy. A good all around Belgian with the to be expected carbonation, high ABV & spice/yeast profile. Pours a slightly orange/yellow/green just barley cloudy color. The head is not impressive at first, but hangs on to every bit of its self & seems to rejuvenate with each tilt. Glorious Belgian aroma of nut-raisin-spice. Clove honey & fruit rounding each other out & shifting slightly more tangy from nose to mouth. Very high ABV & it at times may over power its self with that, seems to flush out some of the fullness of the flavor. But, on the other hand its bubbly enough to keep the aroma pushed up so it works to re-balance the overall flavor nicely. All in all a supper yummy quaff, but not something for steady work. Good with trout or just a good loaf of bread & a jar of cheese wiz. A very fruity smell with a very low hop presence. Somewhat of a light yellow in appearance. Off white head with laceing down the sides of the glass. A fruity type of taste, somewhat of a semi-sweet taste. Medium in bitterness, no harsh aftertaste. Goes down smoothly, leaving a very light dryness in your mouth. High carbonation, very bubbly. This is my first strong belgian ale. Will drink this again, but will look into other similiar styles. A: Yellow, the yellow of a corn maze in october after the first freeze has robbed the green from the world. Slightly hazy. A Lacy head that most certainly follows through. S: Smells like cinnamon, and lemon zest. Has a nice appealing aroma and smells like a very faint perfume. T: Not as complex as everyone makes it out to be. You can tell this is a non-American beer at first sip. It has a spice and lemon taste at first, very similar to a white beer. However after, it has a slight warmth and depth of a deeper and darker malt. Hops exist, but I would have liked a tad more. I needed two of these to appreciate it. It is very well balanced, save the hop deficiency. M: Feels very ethereal, and almost like Christmas. In your mouth. D: Be careful... this goes down too easy... they tell you on the bottle to sip this stuff. If you go three or four... well you'll be very happy. i would drink this stuff for a good long while, and wake up with the best hangover of my life. Note: My local 24 hour store got a few cases of these In, and didnt know the pricing on them, so I paid pretty much 1.75 per 12 oz bottle. They ussually only have marco brews, im glad GOOD beer is becoming more popular. A: Pale straw yellow color with a large bubbly head that leaves some sticky lace. S: Very sweet and fruity. Banana's, cloves, and other citrus fruits. Peppery spices and just a bit of musky aromas that I find common with this style. T: Banana's and cloves again. Harsh alcohol on the tongue. Some peppery spices again. Standard for the style. M/D: Light, crisp, and a bit watery. A bit of alcohol burn, but overall an easy to drink beer. Not a bad beer, but it doesn't really do much for me. Though it is worth a try.